The KONG Cat Window Teaser is a challenging toy for your cat. The Window Teaser can be attached to a smooth surface, so that your cat can catch it. The crinkly sound and catnip make the toy irresistible. Playing is very important and fun for cats. It prevents boredom and keeps your cat active. The KONG Window Teaser stimulates your cat's natural instincts. The colourful toy can be attached easily to a smooth surface. 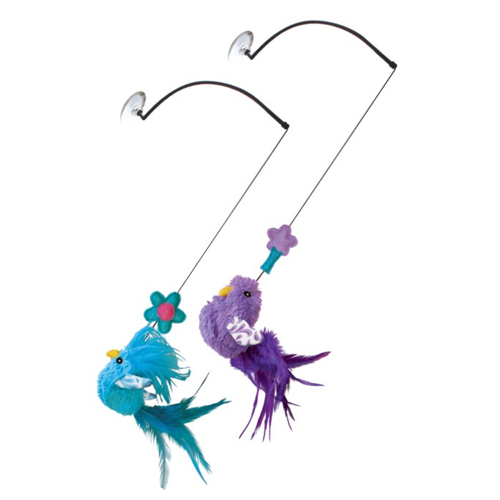 The colourful toy with feathers has a crinkle sound for extra stimulation. The added catnip makes the toy irresistible for your cat! This product ships in assorted colours. This means that colour choice is not possible. Have you used KONG Cat - Window Teaser before? Let us know what you think about this product.